In order to submit an article for the Journal of Clinical Obstetrics & Gynecology, you click “Online Article Submission”link in www.jcog.com.tr address (Only Internet submitting will be considered).You also may follow up all the procedures related with your articles from this web site. Journal of Clinical Obstetrics & Gynecology is scientific journal that aim to reach all national &international medical societies and to publish retrospective, prospective clinical studies experimental researches, reviews, case reports, editorial comment/discussions, letters to the editor,medical education, scientific letters, surgical techniques, distinctive diagnosis, original images, diagnostic evaluations?, medical book reviews, questions-answers and recent issues that determinemedical agenda, that may be related with all topics of medicine. The Journal commits to rigorous peer review, and stipulates freedom from commercial influence, and promotion of the highest ethical and scientific standards in published articles. Neither the Editor(s) nor the publisher guarantees, warrants or endorses any product or service advertised in this publication. All articles are subject to review by the editors and referees.Acceptance is based on significance, and originality of the material submitted.If the article is accepted for publication, it may be subject to editorial revisions to aid clarity and understanding without changing the data presented. - A writer name cannot be added to the manuscript in any time except the writers who signed the copyright transfer form, and the order of the writers’ names cannot be changed. - Approved the final version. It is the authors’ responsibility to prepare a manuscript that meets scientific criterias. The Journal adheres to the principles set forth in the Helsinki Declaration (https://www.wma.net/wp-content/uploads/2016/11/DoH-Oct2013-JAMA.pdf)and holds that all reported research involving “Human beings” conducted in accordance with such principles.Reports describing data obtained from research conducted in human participants must contain a statement in the MATERIAL AND METHODS section indicating approval by the institutional ethical review board and affirmation that INFORMED CONSENT was obtained from each participant. All papers reporting experiments using animals must include a statement in the MATERIAL AND METHODS section giving assurance that all animals have received humane care in compliance with the Guide for the Care and Use of Laboratory Animals( https://www.nap.edu/read/12910/chapter/1) and indicating approval by the institutional ethical review board. Case reports should be accompanied by INFORMED CONSENT whether the identity of the patient is disclosed or not. If the proposed publication concerns any commercial product, the author must include in the cover letter a statement indicating that the author(s) has (have) no financial or other interest in the product or explaining the nature of any relation(including consultancies) between the author(s) and the manufacturer or distributor of the product. If “Ethics Commitee Approval” must be obtained for an article, document obtained from ethics commitee should be sent to “ Online Article Processing” link on www.jcog.com.tr It is the authors’ responsibility to prepare a manuscript that meets ethical criteria. During the evaluation of the manuscript, the research data and/or ethics committee approval form can be requested from the authors if it’s required by the editorial board. All retrospective, prospective and experimental research articles must be evaluated in terms of biostatics and it must be stated together with appropriate plan, analysis and report.p values must be given clearly in the manuscripts (e.g. p= 0.025; p=0.524). Research articles must be evaluated by a biostatistician prior to submissionand the name of the biostatistician should be placed among the authors’ names.Additional information in order to control the biostatistical convenience of the papers that are submitted to biomedical journal can be obtained from the web pagewww.icmje.org.It is the authors’ responsibility to prepare a manuscript that meets biostatistical rules. The official language of the Journal is English. All spelling and grammar mistakes in the submitted articles, are corrected by our redaction commitee without changing the data presented. - It is the authors’ responsibility to prepare a manuscript that meets spelling and grammar rules. In accordance with the Copyright Act of 1976, the publisher owns the copyright of all published articles.Statements and opinions expressed in the published material here in are those of the author(s).Manuscript writers are not paid by any means for their manuscripts. Original Research Articles: Original prospective or retrospective studies of basic or clinical investigations in areas relevant to medicine. 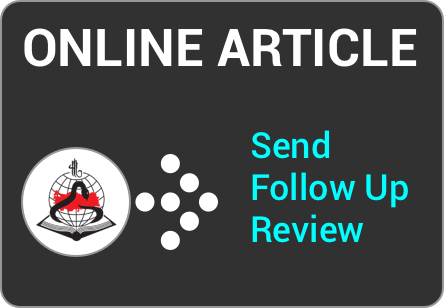 Review Articles: The authors may be invited to write or may submit a review article.Reviews including the latest medical literature may be prepared on all medical topics.Authors who have published materials on the topic are preferred. Case Reports: Brief descriptions of a previously undocumented disease process, a unique unreported manifestation or treatment of a known disease process, or unique unreported complications of treatment regimens. They should include an adequate number of photos and figures. Editorial Commentary/Discussion: Evaluation of the original research article is done by the specialists of the field (except the authors of the research article) and it is published at the end of the related article. Letters to the Editor: These are the letters that include different views, experiments and questions of the readers about the manuscriptsthat were published in this journal in the recent year and should be no more that 500 words. - There’s no title and abstract. - The number of references should not exceed 5. - Submitted letters should include a note indicating the attribution to an article (with the number and date) and the name, affiliation and address of the author(s) at the end. - The answer to the letter is given by the editor or the author(s) of the manuscript and is published in the journal. Scientific Letter: Presentations of the current cardiovascular topics with comments on published articles in related fields. Surgical Technique: These are articles in which surgical techniques are explained. Differential Diagnosis: These are case reports which have topical importance. They include commentaries related with similar diseases. Original Images: Self-explanatory figures or pictures on rare issues in literature. - Text with 300 words, original images, references What is Your Diagnosis? : These articles are related with diseases that are seen rarely and show differences in diagnosis and treatment,and they are prepared as questions-answers. Medical Book Reviews: Reviews and comments on current national and international medical books. Questions and Answers: Scientific educational questions and answers on medical topics. Authors are encouraged to follow the following principles before submitting their material. -The article should be written in IBM compatible computers with Microsoft Word. Abbreviations: Abbreviations that are used should be defined in parenthesis where the fullword is first mentioned.For commonly accepted abbreviations and usage, please refer to Scientific Style and Format. -All figures, pictures, tables and graphics should be cited at the end of the relevant sentence.Explanations about figures, pictures, tables and graphics must be placed at the end of the article. -Figures, pictures/photographs must be added to the system as separate .jpg or .gif files (approximately 500x400 pixels, 8 cm in width and scanned at 300 resolution). -All abbreviations used, must be listed in explanation which will be placed at the bottom of each figure, picture, table and graphic. -For figures, pictures, tables and graphics to be reproduced relevant permissions need to be provided.This permission must be mentioned in the explanation. -Pictures/photographs must be in color, clear and with appropriate contrast to separate details. Cover Letter: Cover letter should include statements about manuscript category designation, single-journal submission affirmation,conflict of interest statement, sources of outside funding, equipments (if so), approval for language for articles in English and approval for statistical analysis for original research articles. Title Page: The title of the manuscript (English), the names and surnames of all authors, ORCID numbers( https://orcid.org/register),academic titles, institutions, business phones and mobile phones, e-mail and correspondence addresses of all authors should be specified.If the article has already been submitted as a paper; the place, the date and the name of the conference where the paper is presented should be given. Abstract: The abstracts should be prepared in accordance with the instructions in the“Categories of Articles” and placed in the article file. -They should be minimally two, and should written English. -The words should be separated by semicolon (;), from each other. -Key words should be appropriate to “Medical Subject Headings (MESH)” (Look: www.nlm.nih.gov/mesh/MBrowser.html). Acknowledgements: Conflict of interest, financial support, grants, and all other editorial (statistical analysis, language editing)and/or technical assistance if present, must be presented at the end of the text. References in the text should be numbered as superscript numbers and listed serially according to the order of mentioning on a separate page,double-spaced, at the end of the paper in numerical order. All authors should be listed if six or fewer, otherwise list the first six and add the et al.Journal abbreviations should conform to the style used in the Cumulated Index Medicus (please look at: www.icmje.org).Declarations, personal experiments, unpublished papers, thesis can not be given as reference. Stephane A. Management of congenital cholesteatoma with otoendoscopic surgery: Case report.Türkiye Klinikleri J Med Sci. 2010;30(2):803-7. Underwood LE, Van Wyk JJ. Normal and aberrant growth. In: Wilson JD, Foster DW, eds. Wiliams’ Textbook of Endocrinology. 1 st ed. Philadelphia: WBSaunders; 1992. p.1079-138. Solcia E, Capella C, Kloppel G. Tumors of the exocrine pancreas.Tumors of the Pancreas. 2nd ed. Washington: Armed Forces Institute of Pathology;1997. p.145-210.